We also developed an other interface based on a Wiimote and a laser pointer which provide the same capacities as the RoboDrive software (see above) to the users. With this interface users can drive the robot with the Wiimote. While with the laser pointer users can draw the robot's attention, the laser spot is automatically tracked by the robot. A laser sound is played by the robot to notice users that the robot can see the light spot. Users can also encircle an object with the laser pointer to provide a new learning examples of this object. Figure 2. 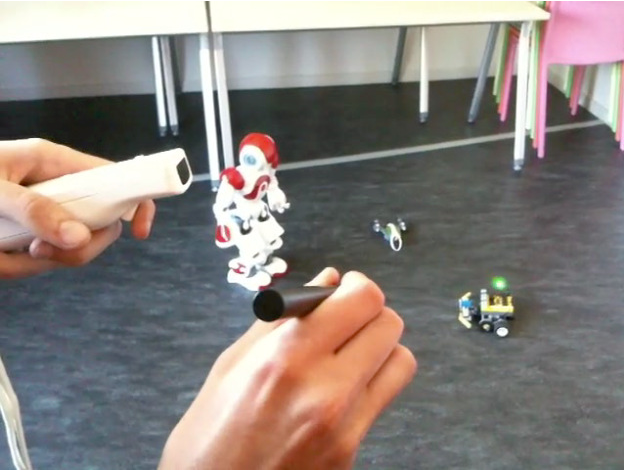 By using a Wiimote and a laser pointer we can easily interact with a robot and show it objects.